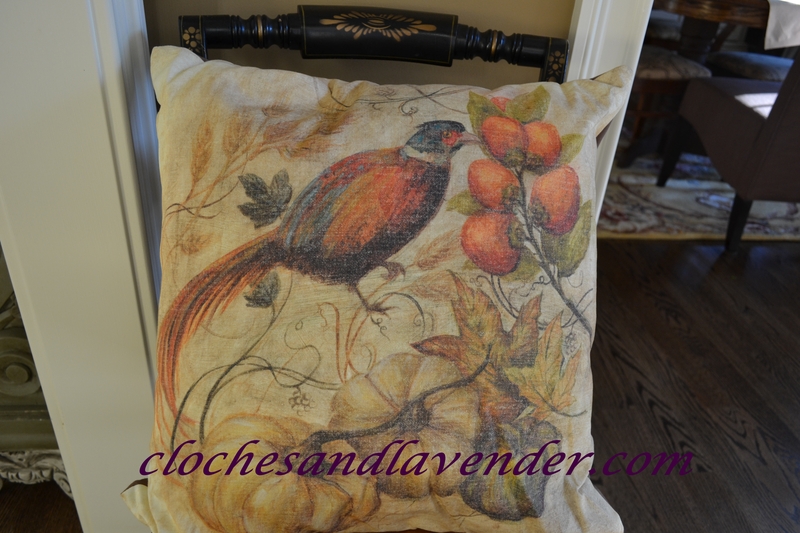 Hello everyone, everything is going well at Cloches and Lavender. I had a special day yesterday and I will be posting the event hopefully tomorrow. It was a splendid day and I wouldn’t have traded the experience for anything! 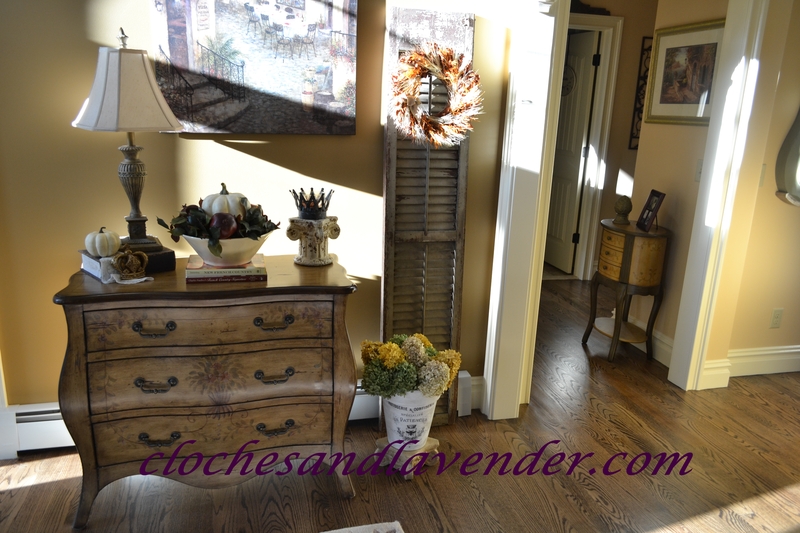 Now to the post today which is featuring our foyer all dressed for fall. Some changes and some things are still the same. I chose to leave my dried Hydrangea here because the colors are glorious. The French pot they are in was one of the first group of pots I made using the transfer Mod Podge method, isn’t she pretty? 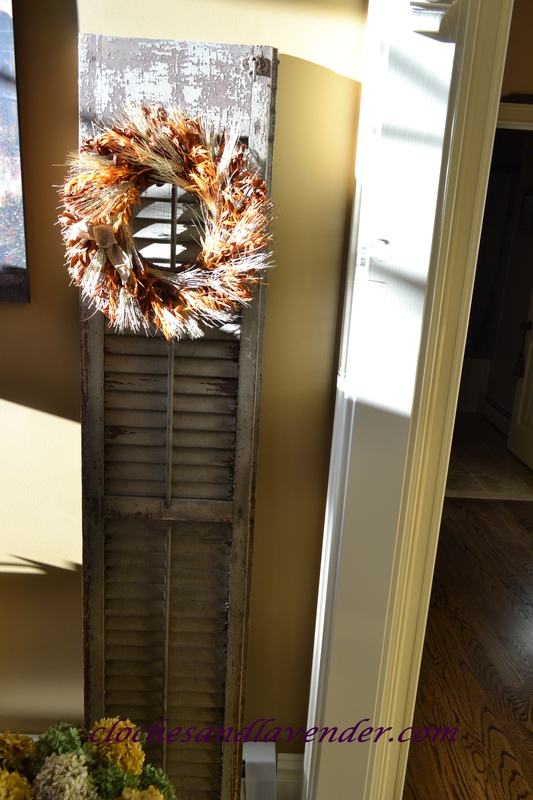 On my antique shutter I added a pretty fall wreath I found at Home Goods a few years ago. My wreaths last years because I take special care of them. Look at the gorgeous sun streaming in the window. 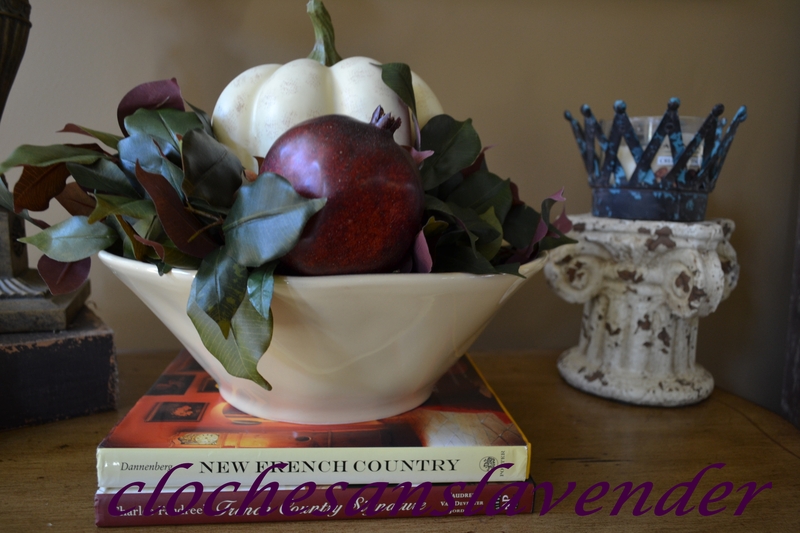 I placed a large bowl I had on hand on our Bombay chest filled with leaves, pomegranates and a medium-sized white pumpkin. You will notice a few of my favorite decorating books. 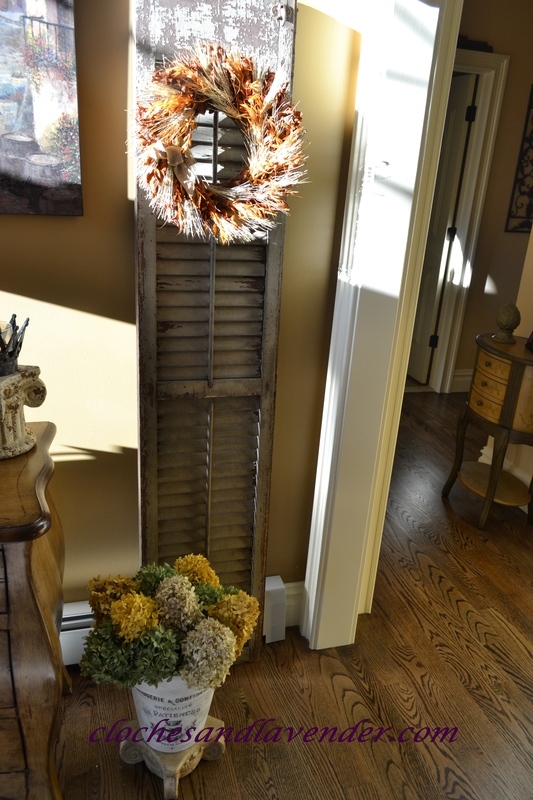 I have found this year the neutral side of fall works better with our home décor. 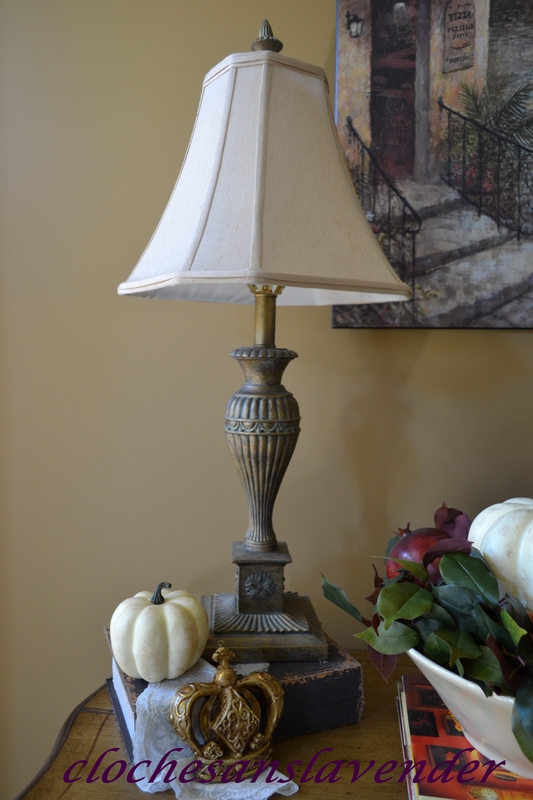 I placed a small crown with a smaller white pumpkin by my lamp with a touch of antique lace that was my grandmothers. 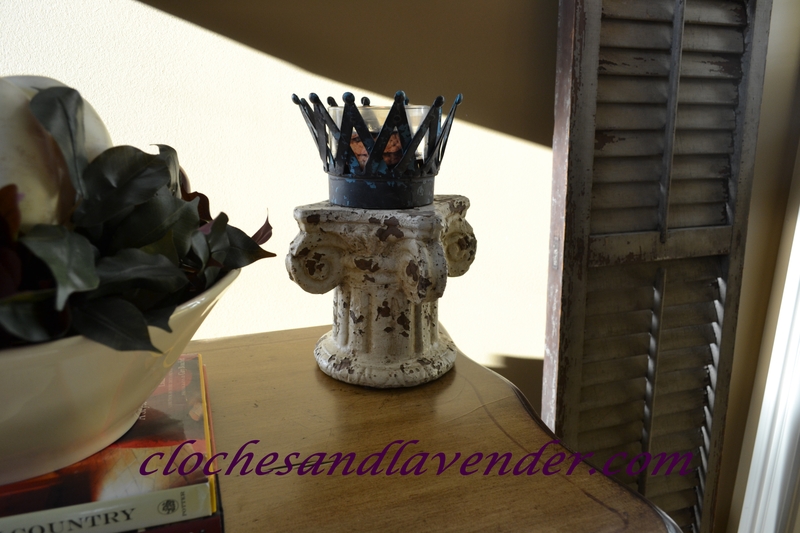 The other side of the chest I used a cement pedestal with a crown placing a candle inside. I am a HUGE candle girl, love the smell it brings to make things feel warm and like home. 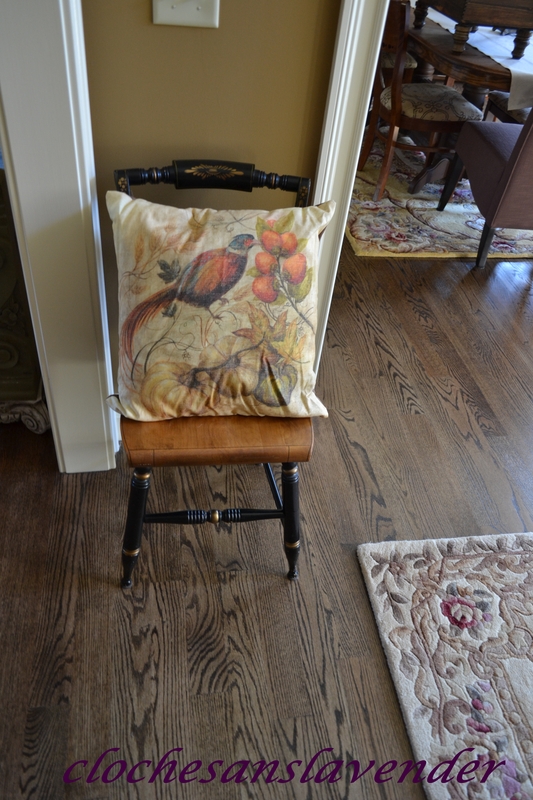 My moms Hitchcock chair resides in the foyer and I placed a beautiful pillow there and I love the colors and design. On the back of our front door you’ll notice another wreath that is a match to the one on the shutter. This large tassel I bought so long ago I can’t remember where it is from but the grand size makes it a favorite for me. Below is an artichoke finial on a pedestal from Ballard I have had for years. The foyer is a beauty for guests when they enter into the home. I hope you enjoyed the tour. Have a great day! So many pretty details, Cindy! 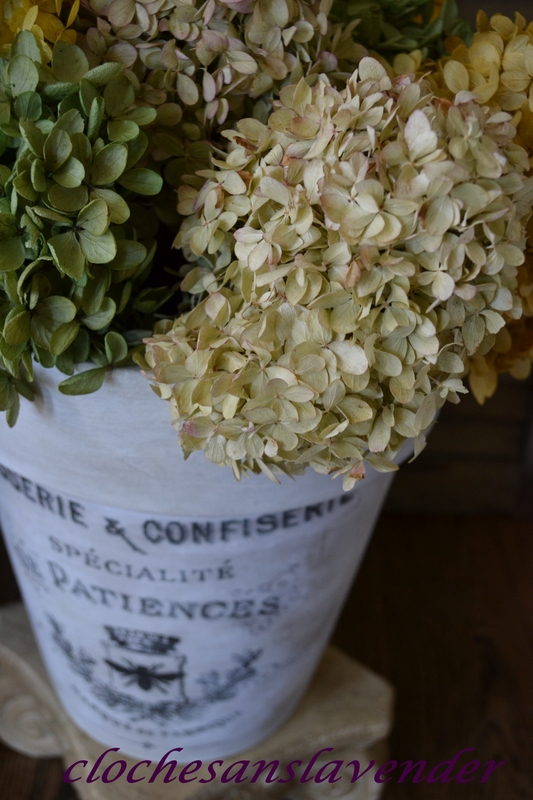 I just love hydrangeas – they look perfect in your flower pot. Your mother’s chair is just beautiful. YAY!!! My comment showed up! Thanks for “un-spamming” me! Everything looks beautiful and characteristic of the fall season. I love fall colours – so gorgeous! Your place looks wonderful! I love decorating for all the seasons but the fall and Christmas are my favorites. Hi Cindy, your entry is gorgeous. I love the elements you used here. So welcoming. I too like a wreath or something on the inside of the front door so we can enjoy it from the inside. Love your wreath. Thanks very much Laura. I hope you are doing well. You are always here. Hi Cindy! Everything looks so beautiful! I love the glowing sunlight in your photos. I’m sorry about my comment thingamajig not working. I’m not sure what’s up with that, but I’ve heard it from a few people now. 😦 Hopefully, it’s just a google glitch that will be fixed soon. Have a wonderful day! Thanks Laurel, I’m still having problems leaving comments on your blog. Oh I do love all this! The colors of your hydrangeas are fabulous! I love seeing vignettes put together like this. The wreath on the shutter is perfect and even more so with the sun highlighting it. Great textures and colors throughout- perfect! 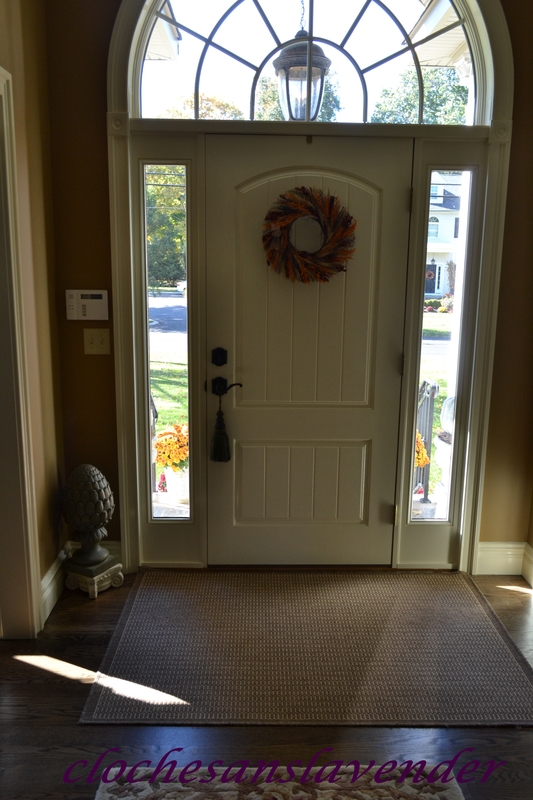 What a beautiful entry way, Cindy! I love all of your pretty fall touches. Can you believe the holidays are just around the corner? Pretty soon we will start decorating for Christmas, I am just not ready for it yet this year!! You do have a beautiful entry that is bigger than my main bathroom! If only. Your fall touches are very pretty. I can’t believe in a month and a half it will be Christmas, ugh!/ PS…I didn’t feel cheating I was embarrassed that I “bragged” about 1 photo. I so wish I had a foyer like that! I can see why you think neutral colors look better in your home. There’s something very ‘french country’ about it and I think that’s why. That’s exactly why and the fact that our home is open concept to an extent. Thanks Carol, I adore old pieces. I really like your Fall decor in the foyer! That wreath on the old shutter is my favorite. I also love your front door. I love the style of it with the beadboard look. Thanks Kelly, we adore our door. Our interior doors are the same, so pretty. 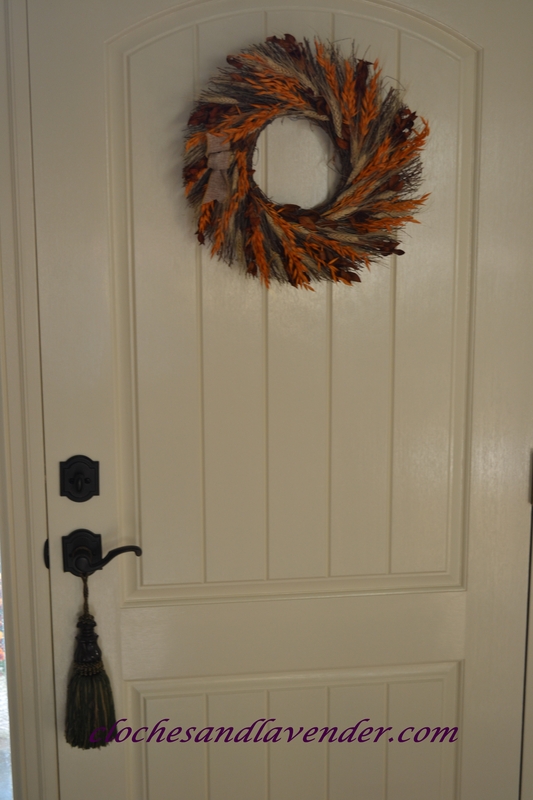 Your foyer is beautiful, love the fall touches. Cindy, your fall touches are lovely! Love your door and hydrangeas are so timeless. Very soft and French Country kind of feeling here. Thank you for sharing with us and enjoy your day. Thanks Sandi, I’m happy the way it turned out.